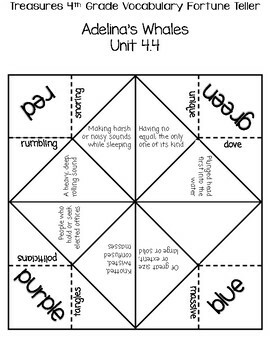 There is nothing boring about Vocabulary when you practice with a fortune teller/cootie catcher! This is a vocabulary fortune teller for the story "Adelina's Whales" from the Treasures 2007 4th Grade Unit 4.4. Click the ★ under High Heel Teacher to follow my store. You will be sent updates on products and promotions! Did you purchase this product? Don't forget to leave feedback to earn TPT credits toward future purchases!